Pictured are Annalise Britt, William Webb, Emma FitzGerald, WTVM Chief Meteorologist Derek Kinkade, Evan Fender, Savannah Grace Ewing, Colton Crawford. 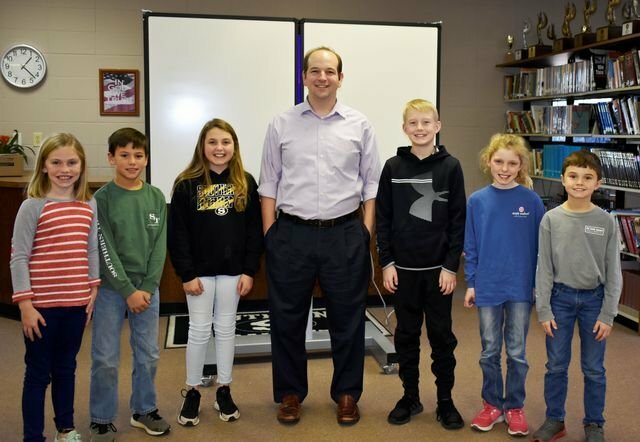 Southland Academy third, fourth, and fifth grade students were quite engaged as WTVM Chief Meteorologist, Derek Kinkade, talked to the students about his profession and different facets of weather. Captivated by the array of pictures in the slideshow, the students viewed tornados, hurricanes, snowstorms, and record size hail. They also saw pictures of the devastation to Americus from the 2007 tornado. Mr. Kinkade was mindful to discuss the recent progression and consequences of Hurricane Michael. The Southland students were excited to have a TV personality on campus; likewise, they anxiously await to see their picture and the video taken by Mr. Kinkade which will be on the evening news. Mr. Kinkade provided a great scientific educational experience for the students.